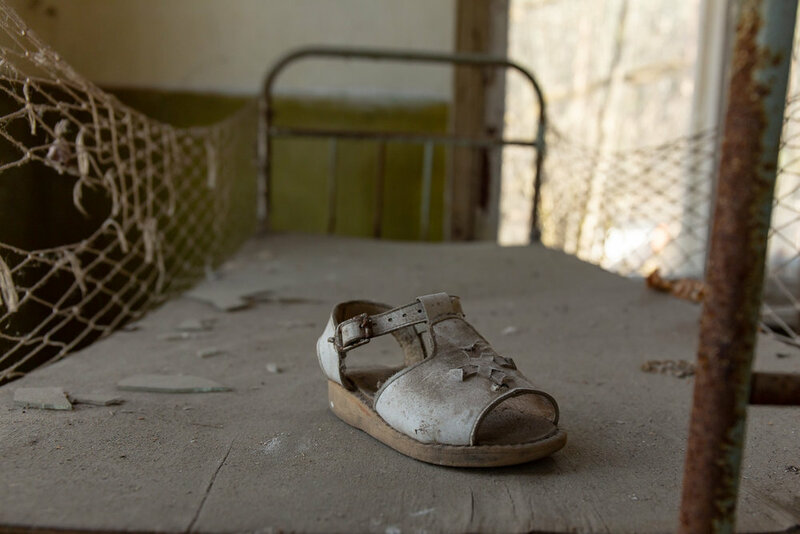 Located just a few kilometres south of Chernobyl Nuclear Power Plant is the remains of Kopachi Village (Копачі in Ukrainian). As with all of the villages in the area it was thriving in 1986. It had a young population and was home to 1114 people on the day of the disaster. As a result of its proximity to the power plant it was heavily contaminated. The villagers were evacuated and all of the wooden buildings were torn down. The remains of the buildings and the contaminated topsoil were buried in hastily dug pits. However this was not an ideal solution. The buried buildings and the contaminants they held were washed through into the water table and allowed the radioactive isotopes to permeate deeper into the ground. The village of Kopachi now consists of the kindergarten and another brick building along with the war memorial which is tended by the power plant workers. Around the area are a series of mounds topped by an international radiation symbol. This is the only evidence of the location of other buildings within the village. The kindergarten stands silent. The beds used for daytime naps are rusting, toys and clothes scattered as they would in any child’s bedroom. The only difference is the desolate and cold feel the dust coated toys exude. The soil and water surrounding the village is still radioactive and contains high levels of plutonium, strontium-90 and caesium-137. There are a number of hot spots in the area including one at the base of a tree by the kindergarten. No-one lives in the area as the radiation levels are relatively high (compared to other areas within the zone).